With each album, Jessie Ware has matured and grown in confidence. Where 'Devotion' was mostly characterised by the skittering production of Dave Okumu and Julio Bashmore, on 'Tough Love' her own voice became louder: both metaphorically and literally. 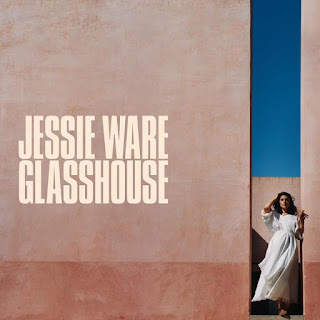 'Glasshouse', Ware's third album, continues this trend. It feels like, more than ever, we're hearing directly from the singer herself, and not through the filter of trendy producers. That's surprising considering the number of collaborators here: from producers like Cashmere Cat and Benny Blanco to songwriters like Ed Sheeran, Julia Michaels and Ryan Tedder. As the saying goes, you can only write about what you know. And here Ware offers a glimpse into her family life, her relationship with her husband, a broken past with her father, a bright future with her newborn child. It's most potent in closer Sam, a simple acoustic song that's rich in storytelling. "I hope I'm as brave as my mother," she sings in the chorus, "I hope she knows that I found a man far from my father / Sam, my baby, and me". It's a beautiful end to the album that mirrors Ware herself, somewhat shying away from the glamorous limelight and revelling in a simpler life. At the other end is opener Midnight, heady with intoxicating romance as she asks her lover to "meet me in the midnight". Yet between these two songs, family life isn't always so easy. Thinking About You reflects Ware's guilt of leaving her baby to focus on music ("don't you know I'm dying just to spend a little more time with you"). Selfish Love is a sultry dangerous affair crackling over a bossa nova beat. And with Hearts her carefully crafted family unit comes crashing down. The yearning melodies of First Time mark a central highpoint. Where so many pop songs focus on the rush of new love, here she depicts the difficulties of keeping that fire burning over time and distance. "Don't hold me like you already know me," she cries in the chorus, a lyric so simple yet loaded with longing. If lyrically 'Glasshouse' sees Ware bravely opening up, musically it's far from daring. She combines soulful romance, Latin beats, gospel harmonies and gentle balladry, but it's all so safe and polished that it undermines the rawness of the lyrics. Only Your Domino really pushes out of the comfort zone, with its urgent giddy synths and crystalline production. The spiky edge of her earlier work is sorely missing here, Ware too easily slipping into Sade-esque easy listening. This glasshouse is pleasingly transparent but all too square. Listen: 'Glasshouse' is out now.